If you've seen any of my Instagram Stories over the past few weeks, you may have heard me whining about how I was breaking out like CRAZY. As soon as one spot would heal, three or four more would pop up. I'm pretty sure it was from all the stress of moving, but it was really getting me down. 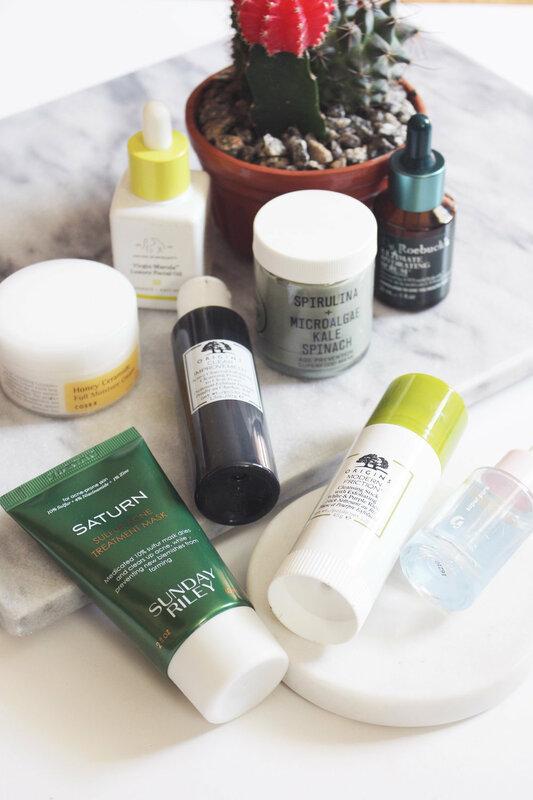 I hunkered down and put together a routine that ended up really helping get my skin back to normal, and as I gathered the products together, I noticed a lot of them had green packaging in common. Subliminal messaging, perhaps? My skin just constantly felt congested, so I was alternating between the Origins Modern Friction Cleansing Stick* and Clear Improvement Cleansing Powder* for cleansing. The Modern Friction stick has been my go-to for the morning, and it feels so refreshing. It gives a very gentle exfoliation, so it wasn't too abrasive on breakouts, and it didn't strip my skin. While I had active breakouts, I rubbed the cleanser into my hands rather than directly on my face. On nights when I hadn't used the cleansing stick, I would mix some of the Clear Improvement powder into Glossier Milky Jelly Cleanser to give it a little kick. The charcoal really helped to clear out my pores, and, again, didn't strip my skin. I of course used a few masks to try and clear things up, and there were two standouts for me. The Sunday Riley Saturn Sulfur Acne Treatment Mask* is specifically for breakouts and acne-prone skin, containing 10% sulfur to fight acne, as well as niacinamide and zinc to soothe and promote clear skin. I prefer using this as a 10-minute mask targeted on my breakouts rather than a spot treatment (which it also says you can use it for). I used it about twice per week and I really noticed an improvement in my skin. It shrank down my spots and made them less red and painful. Word of warning, though - just wash it off with water and not a washcloth - I used a washcloth, and then everything in the same load of laundry of that washcloth ended up smelling like sulfur. The other mask I reached for a lot (and am still reaching for) is the Youth to the People Age Prevention Superfood Mask. * It's a creamy clay mask that really feels like green juice straight to the face. My skin always feels cleansed, but never stripped, after using this mask. It doesn't dry and crack like other clay masks, but rather stays quite soft. It helped my skin look brighter and clearer after every use. I used a combo of two serums, usually - one to treat, and one to hydrate. The Glossier Super Pure serum has been a lifesaver. It's a niacinamide and zinc serum that keeps the skin soothed and blemish-free. I've found that a lot of my breakouts stem from my skin being dehydrated, so a good, hydrating serum was also key. I've been obsessed with the Dr. Roebuck's Ultimate Hydrating Serum* all summer, and it's definitely going to transition well into the fall and winter. It has a thicker formula, but it sinks into the skin quickly and feels so hydrating, plumping, and smoothing. I definitely saw a difference on days I used this compared to days when I didn't. I went for two types of moisturizers during this time (and sometimes a mix of both) - a lightweight gel-cream product for daytime, and a light yet nourishing oil for night. 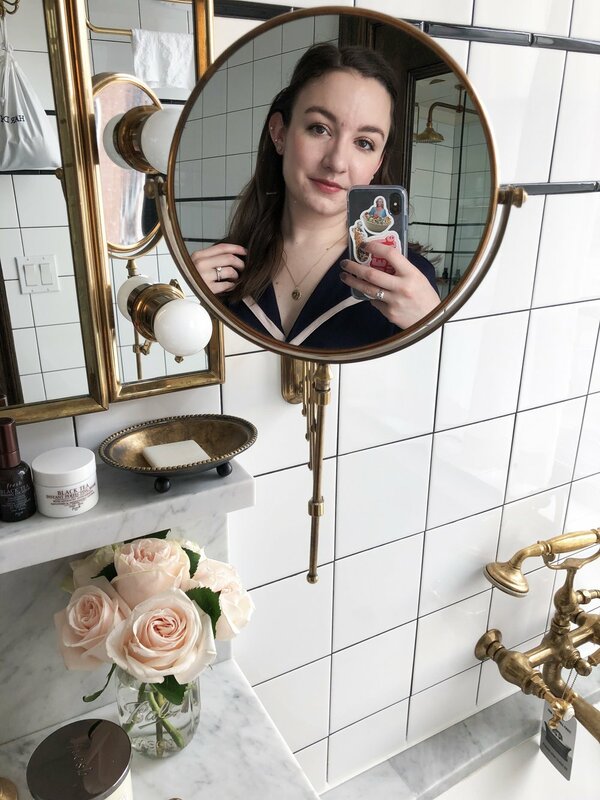 The CosRx Honey Ceramide Full Moisture Cream has been a staple for the past few months, but it really came in handy while I was breaking out. The formula is lightweight and yet super hydrating, so I could use it during the day and be moisturized all day long without my skin feeling clogged. 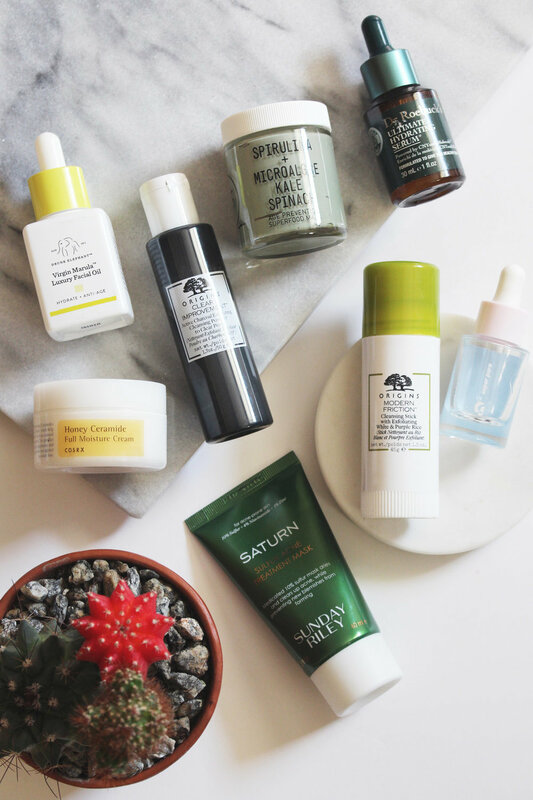 And at night, I always finished off my skincare with a layer of the Drunk Elephant Virgin Marula Luxury Facial Oil - I like using Marula oil because it feels really light on the skin.